Hypothyroidism is a condition related to having an underactive thyroid gland that doesn’t properly make or release thyroid hormones. The thyroid gland normally releases many crucial hormones that travel throughout the bloodstream and reach receptors that are found throughout the whole body, so a disturbance in thyroid function can cause widespread, noticeable health problems. According to some estimates, 40 percent of the population suffers with some form of low thyroid function. Women, especially older women, are the most susceptible group for developing hypothyroidism. People who are elderly or who have other existing autoimmune diseases – like type 1 diabetes, rheumatoid arthritis and celiac disease, for example – are also at a higher risk. Some of the most common symptoms of hypothyroidism? Changes to your metabolism, heart function, digestion, energy, appetite, sleep, mood – even the growth of your hair, skin and nails. The first step in treatment of hypothyroidism is to eliminate the effects and causes of the thyroid dysfunction, such as inflammation, overuse of medications, nutrient deficiencies, and changes in hormones due to stress. The hypothyroidism diet eliminates foods that can cause inflammation and immune reactions and instead focuses on foods that help heal the GI tract, balance hormones, and reduce inflammation. The most common cause of hypothyroidism in developed nations is a condition called Hashimoto’s thyroiditis. This occurs when the thyroid becomes inflamed and is considered to be an autoimmune disorder. When someone has Hashimoto’s, their own body essentially begins to attack itself by producing antibodies that try to destroy the thyroid gland. Why does this happen? The immune system mistakenly thinks that the thyroid cells are not a part of the body, so it tries to remove them before they can cause damage and illness. The problem is that this causes widespread inflammation, which can result in many different problems. 90 percent of people with hypothyroidism have Hashimoto’s that inflames the thyroid gland over time, but this isn’t the only cause of hypothyroidism. A diet low in nutrient-rich foods, especially in iodine and selenium (which are trace minerals crucial for thyroid function), increases the risk for thyroid disorders. The thyroid gland needs both selenium and iodine to produce adequate levels of thyroid hormones. And these nutrients also have other protective roles in the body; for example, severe selenium deficiency increases the incidence of thyroiditis because it stops activity of a very powerful antioxidant known as glutathione which normally controls inflammation and fights oxidative stress. In some people, since the pituitary gland makes a hormone called thyroid-stimulating hormone (TSH) that controls the levels of hormones being pumped out of the thyroid a problem with the pituitary gland can cause changes to thyroid function. However, this is pretty rare; it’s believed to only be the cause in about one in every 100 cases. An unhealthy gut environment can contribute to nutrient deficiencies and raise autoimmune activity in the body. Gut inflammation can be triggered by food sensitivities or allergies, including those to gluten and dairy. Other causes of a damaged gut are high stress levels, toxin overload from diet and the environment, and bacterial imbalances. When leaky gut occurs, small particles that are normally trapped inside the gut start to leak out into the bloodstream through tiny openings in the gut lining, which creates an autoimmune cascade and a series of negative symptoms. Although it’s not a very common cause, sometimes newborns are born with a dysfunction of the thyroid gland, a genetic condition called congenital hypothyroidism. Some evidence shows that people are more likely to develop hypothyroidism if they have a close family member with an autoimmune disease. But according to the National Institute of Health (NIH), the likelihood of genetic hypothyroidism is very low and only about one out of every 4,000 newborns is born with a thyroid disorder. During pregnancy, although it’s not exactly known why, some women begin to produce very high levels of thyroid hormones, followed by a very rapid decline. This condition is known as postpartum thyroiditis. Usually after giving birth the condition goes away with some time. Use of certain medications can also cause hypothyroidism, especially recovering from cancer treatments, surgery, or taking prescriptions for mental health or heart disease. Stress impacts hormones and is known to worsen inflammation. Stress can raise levels of cortisol and adrenaline, which disturbs neurotransmitter function and worsens symptoms of thyroid disease —these include low energy levels, poor mood, low concentration, disturbed appetite and weight gain, and the inability to get good sleep. Exercise and a healthy diet are important for controlling chronic stress and managing hormone-related neurological function. Research shows that people who regularly exercise usually get better sleep, deal with stress better and usually maintain a healthier weight, too, all of which reduce some of the biggest risk factors and symptoms associated with hypothyroidism. The thyroid is considered a master gland and in addition to producing crucial hormones, it also helps control the process of turning nutrients from food into useable energy that your body runs on. Because the thyroid plays such a major part in your metabolism, dysfunction can wind up affecting almost every part of the body, including your energy levels and ability to burn calories. Key hormones produced by the thyroid also help the liver break down cholesterol that circulates through the bloodstream. The thyroid can also stimulate enzymes that are needed to control triglyceride fat levels, so this is why changes in thyroid function can lead to heart problems. Other noticeable effects of hypothyroidism include moodiness and a sluggish metabolism. Essentially when your thyroid is underactive your metabolism will slow down, which might mean you always feel tired or struggle to keep off weight. Your mood is especially susceptible to changes in hormone levels, so some people with hypothyroidism wind up dealing with depression, anxiety, trouble getting good sleep, and low immunity. The thyroid gland helps regulate chemical messengers called neurotransmitters that control your emotions and nerve signaling, which is the reason an out-of-balance thyroid can mean drastic emotional changes at times. Wild-caught fish – These provide omega-3 fatty acids EPA/DHA that are essential for hormone balance and thyroid function. Balancing the level of omega-3 to omega-6 fatty acids in your hypothyroidism diet can reduce inflammation and support healthy neurological function. Wild fish like salmon, mackerel and sardines are some of the best sources of omega-3s to increase neurotransmitter activity and support a healthy mood and immune system. Coconut Oil – Provides medium-chain fatty acids in the form of caprylic acid, lauric acid and capric acid that support a healthy metabolism, increase energy and fight fatigue. A staple of the hypothyroidism diet, coconut oil is easy to digest, nourishes the digestive system and has antimicrobial, antioxidant and antibacterial properties that suppress inflammation. Coconut oil helps improve immunity and can increase brain function, endurance and your mood while stabilizing blood sugar levels. Seaweeds – Some of the best natural sources of iodine, these help prevent deficiencies which disturb thyroid function and should appear in your weekly hypothyroidism diet. 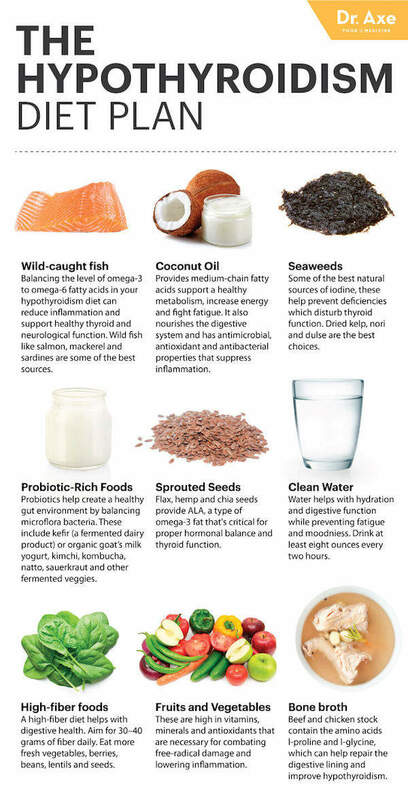 Kelp, nori and dulse are the best choices. Look for dried varieties of these at health food stores and use them in soups, with tuna fish or in fish cakes. Probiotic-Rich Foods – These include kefir (a fermented dairy product) or organic goat’s milk yogurt, kimchi, kombucha, natto, sauerkraut and other fermented veggies. Part of your hypothyroidism diet, probiotics help create a healthy gut environment by balancing microflora bacteria, which reduces leaky gut syndrome, nutrient deficiencies, inflammation and autoimmune reactions. Sprouted Seeds – Flax, hemp and chia seeds provide ALA, a type of omega-3 fat that’s critical for proper hormonal balance and thyroid function. Adequate levels of fats in your hypothyroidism diet support a healthy mood and brain function, while helping to lower inflammation. Eating plenty of healthy fats also stabilizes blood sugar levels and can help you stay at a healthy weight. Clean Water – Water helps with hydration and digestive function while preventing fatigue and moodniess. For prevention of constipation, low energy and sugar cravings, drink at least eight ounces every two hours. High-fiber foods – People with hypothyroidism may have digestive difficulties, so aim for 30–40 grams of fiber daily. In addition to a high-fiber diet helping with digestive health, it improves heart health, balances blood sugar levels and supports a healthy weight by making you feel fuller. Some easy ways to increase fiber intake include eating more fresh vegetables, berries, beans, lentils and seeds. Bone broth – Beef and chicken stock contain the amino acids l-proline and l-glycine, which can help repair the digestive lining and improve hypothyroidism. Bone broth also contains numerous important minerals that nourish the digestive tract and prevent deficiencies like calcium, magnesium, phosphorus and silicon. As part of your hypothyroidism diet, bone broth has been shown to help overcome food sensitivities, improve energy and fight fatigue, increase immunity, and lower pain of the muscles and joints. Ancient Nutrition Bone Broth Protein is an all-natural, Paleo-friendly protein supplement that I’ve created that helps anyone who loves bone broth enjoy the benefits of real, homemade bone broth without spending hours cooking bones in your kitchen. For as long as humans have been cooking food over fire, bone broths — chicken, beef, turkey, fish and more — were staples in the traditional diets of every culture. And for good reason. The long cooking process allows easier digestibility and assimilation of key nutrients. Fruits and Vegetables – These are high in vitamins, minerals and antioxidants that are necessary for combating free-radical damage and lowering inflammation. They are nutrient-dense and should make up a large portion of a healthy diet since they support digestive health, brain function, heart health, hormone balance and a healthy weight. Goitrogen Foods – Eating large amounts of raw Brassica vegetables like broccoli, cauliflower, cabbage, kale, soy and Brussels sprouts might impact thyroid function because these contain goitrogens, molecules that impair thyroid perioxidase. When consuming these cruciferous vegetables, it’s best to steam them for 30 minutes before consuming to reduce the goitrogenic effect and keep portions moderate in size. These pose more of a risk for people with iodine deficiencies. Tap water – Contains fluorine and chlorine that inhibit iodine absorption. As mentioned earlier, iodine levels may be high enough in most people’s diets, but this doesn’t mean that everyone is capable of absorbing and using all of the mineral. Gluten – Many people with thyroid issues are also sensitive to gluten or have celiac disease, an autoimmune disease that results in an allergy to gluten. Gluten is found in all wheat, rye and barley products, so carefully check ingredient labels to avoid hidden gluten that is lurking in many packaged foods. Undiagnosed sensitivities to gluten can further raise inflammation, create nutrient deficiencies and worsen hormonal problems. Conventional Dairy – Like gluten, dairy can be especially problematic for the thyroid, triggering reactions that raise inflammatory responses. Avoid conventional cow’s milk dairy products that are not organic and have been pasteurized. Consumption of organic, raw goat’s milk or organic A2 cow’s milk is a better choice. Sugar – Sugar can disrupt the hormone balance necessary for metabolism. People with thyroid issues have a difficult time losing weight, and since the thyroid is a key gland for hormonal balance and metabolism, it’s best to avoid sugar as it can contribute to hormonal disturbances, fatigue, mood changes, worsened depression and weight gain. 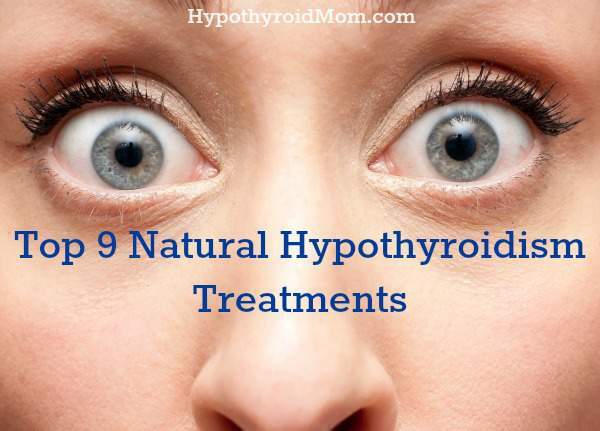 In addition to adopting a hypothyroidism diet, uses these natural remedies to reduce (or in some cases eliminate) hypothyroidism. Ashwagandha is an adaptogen herb that helps the body respond to stress, keeping hormone levels better in balance. Adaptogens help lower cortisol and balance T4 levels. In fact, in clinical trials, supplementing with Ashwagandha for eight weeks helped hypothyroidism patients significantly increase thyroxine hormone levels, which reduced the severity of the disorder. Also, try other adaptogen herbs like rhodiola, shisandra, ginseng and holy basil that have similar benefits. Studies show that even small amounts of supplementary iodine (250 micrograms) cause slight but significant changes in thyroid hormone function in predisposed individuals. A diet rich in whole foods that contain iodine — including fish, sea vegetables, eggs, raw dairy and seaweed — can help prevent deficiency. Be careful about iodine supplements with Hashimoto’s disease. While it’s nearly impossible to get too much from eating a variety of healthy foods alone, sometimes people taking supplements or eating very high amounts of dried algae and seaweed can exceed the recommended upper daily limit. Because it helps balance hormone levels, selenium can lower the risk for experiencing thyroid disorder during pregnancy (postpartum thyroiditis) and afterwards. Other studies have shown that when selenium deficiency is resolved through supplementation, patients experience on average 40 percent reduction in thyroid antibodies compared to a 10 percent increase in the placebo group. Selenomethionine is the preferred form of selenium supplementation as it is the form found naturally in food and about 90% of it is absorbed. Probiotics can help heal the gut and aid in nutrient absorption while reducing inflammation. Other benefits of a high-quality probiotic include helping to maintain a stronger immune system, increasing energy from production of vitamin B12, reducing bacterial or viral growth in the gut such as candida, improving skin health, and helping with appetite control and weight loss. It’s important to note that there are different types of strains of probiotics. The health effects experienced by one probiotic may be completely different from the health benefits seen from another probiotic.Certain strains of probiotics support a healthy immune system.Others are great for digestion. That’s why it’s important to pick the right probiotic for your needs. It’s also wise to consume a wide range of probiotics in your food or supplements so that you’re covered. The more, the merrier. I recommend soil-baed probiotics that are shelf-stable, meaning it doesn’t need to be refrigerated. *My ProBiome Rx Thyroid Support System was specially designed to include ashwagandha, kelp, selenium, as well as soil and plant based probiotic and prebiotic blend all together in one supplement. An amino acid used in the synthesis of thyroid hormones. Thyroxin (T4) is naturally produced from the iodination of tyrosine, a nonessential amino acid obtained both from protein-containing dietary sources and through the body making some itself. Supplementing with L-tyrosine has been shown to improve sleep deprivation and can help combat fatigue and a poor mood by improving alertness and neurotransmitter function. One reason L-tyrosine is beneficial in healing thyroid symptoms is because it plays a role in the production of melatonin, dopamine and/or norepinephrine, which are our natural “feel good” hormones. L-tyrosine is available by the brand Pure Encapsulations. Essential fatty acids found in fish oil are critical for brain and thyroid function. DHA and EPA omega-3s found in fish oil are associated with a lower risk for thyroid symptoms, including anxiety, depression, high cholesterol, inflammatory bowel disease, arthritis, diabetes, a weakened immune system and heightened autoimmune disease. Omega-3 fish oil such as cod liver oil can also help balance levels of omega-6s in the diet, which is important for ongoing health. Vitamin B12 and thiamine are important for neurologic function and hormonal balance. Research shows that supplementing with thiamine, also known as thiamin or Vitamin B1, can help combat symptoms of autoimmune disease, including chronic fatigue. In one clinical study, when patients with Hashimoto’s were given 600 milligrams per day of thiamine, the majority experienced complete regression of fatigue within a few hours or days. Vitamin B12 is another important nutrient for fighting fatigue since it benefits the central nervous system in many important ways: maintaining the health of nerve cells (including neurotransmitters), protecting the covering of nerves called the cell’s myelin sheath, and turning nutrients from food into useable energy for the brain and body. Designs for Health B-Supreme has an array of B vitamins (including thiamine and Vitamin B12) and additional co-factors that help the body utilize the B vitamins. To improve thyroid function and heal symptoms of autoimmune disease, try some of these essential oil protocols using my certified organic essential oil brand Ancient Apothecary. I only wanted to develop the highest quality products based on real science and proven results. Results that I’ve seen personally, with my family, my own mom and thousands of patients in my clinic right in Nashville, TN. Each oil is 100% Pure, Certified USDA Organic, Indigenously Sourced and Therapeutic Grade. Combine three drops of Frankincense Oil with five parts Lemongrass Oil and five parts Clove Oil . Rub these directly on the thyroid, which is located at the front lower part of your neck, below the Adam’s Apple above the collar bone. To combat muscle or joint pain try my Ache Away Organic Essential Oil . To fight fatigue, try a combination of Peppermint and Lemon Oil . To improve your mood and reduce anxiety or irritability, use Frankincense and Lavender . Use an essential oil diffuser like this one in your home and office or add them to a bath. 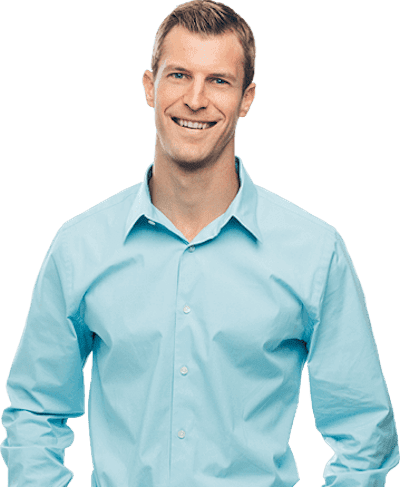 Dr. Josh Axe is a certified doctor of natural medicine, doctor of chiropractic, and clinical nutritionist with a passion to help people get healthy by using food as medicine. Dr. Axe has created one of the top 10 most visited natural health websites in the world at www.DrAxe.com which has over 15 million monthly visitors. Dr. Axe has been a physician for many professional athletes. In 2009, he began working with the Wellness Advisory Council and Professional Swim Teams. He worked with professional swimmers, including Ryan Lochte and Peter Vanderkaay, providing nutritional advice and musculoskeletal work on the athletes to increase their performance. He also traveled to the 2012 Games in London to work with USA athletes. Dr. Axe has authored several books including his new book Eat Dirt: Why Leaky Gut May Be the Root Cause of Your Health Problems and 5 Surprising Steps to Cure It . 1. Gannon, J.M. et al. Subtle changes in thyroid indices during a placebo-controlled study of an extract of Withania somnifera in person with bipolar disorder. J Ayurveda Integr Med. 2014 Oct-Dec;5(4):241-5. 2. Reinhardt, W., et al. Effect of small doses of iodine on thyroid function in patients with Hashimoto’s thyroiditis residing in an area of mild iodine deficiency. Euro J. Endocrinol. 1998 Jul;139(1):23-8. 3. Drutel, A., et al. Selenium and the thyroid gland: more good news for clinicians. Colin Endocrinol (Oxf). 2013 Feb;78(2):155-64. 4. Gartner, R., et al. Selenium supplementation in patients with autoimmune thyroiditis decreases thyroid peroxidase antibodies concentrations. J Clin Endocrinol Metab. 2002 Apr;87(4):1687-91. 6. Costsantini, A., Pala, M.I. Thiamine and Hashimoto’s thyroiditis: a report of three cases. J Altern Complement Med. 2014 Mar;20(3):208-11. Philip my wife has hypothyroidism for a few years.she is 51 on recognizing 75 mg and I don’t think it’s working.she is almost always tired.no energy sleep ing 10-12 hours aday.what else do .I have her vitamin d magnesium tablets.we tried liquid iodine too.she eats egged fish yogurt wheat bread and other vegetables and fruits. Studio cc’d old sweating she also menopause.please help me. What about cryotherapy? I’ve heard it may help increase your metabolism and assist with hypothyroidism. I’m so confused, I to don’t like taking medicine, I was on levothyroxine 25mcg for 5-6 months and I told my Dr I wanted to try something natural, because the medicine was causing all my joints to ache, so now I’m trying this plan from Forefront Health, so far so good, but everyone has something slightly different go with what works for you…if your not sure try it…. otherwise you’ll be on medication, my mom was on thyroid medication for a long time, that’s not who I want to be… So I’m trying natural. What are you taking from Forfront Health, I looked at their website and at some of the products, but not sure what to start with first. I found a thyroid health formula at gnc that has a lot of the supplements built into it. I just started taking them so no report on them yet. It has the l-tyrosine, iodine, ashwaghanda and selenium in it. My son is 9months old and I was diagnosed a couple of days ago with Hypo/levels at 4.94. My Dr. suggested levothyroxine and retesting in 6 weeks. I do not desire to be dependant on meds for the rest of my life. I am also gluten sensative. I know there is a better solution for my body than popping a pil. I am also breastfeeding…early in my research…but do you know if the remedy you have suggested above is all saf and ok for BF moms? My daughter is 6.5 months and I was just diagnosed. I feel the exact same way, about medicaitons. Can you let me know what your research says. I have been researching for the past 24 hours and I am really just coming up empty. My wife suffers TSH64.34.please suggest suitable medicine .hypothyroidism. Very informative article. Is there a specific time when these supplements should be taken? Morning, evening?